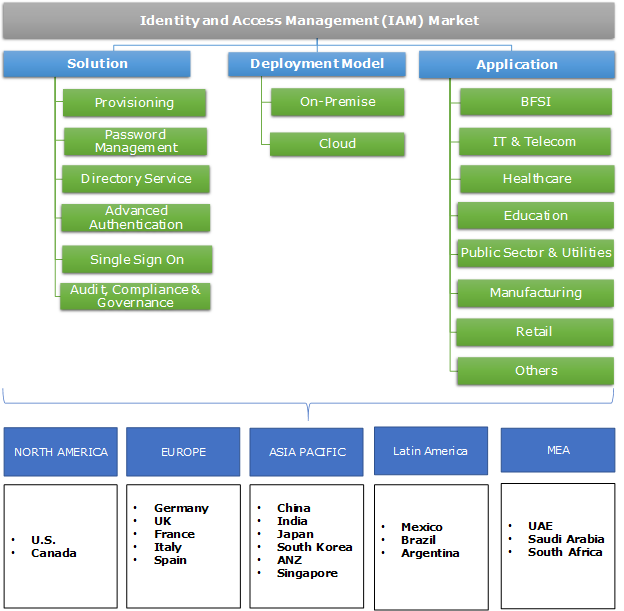 Identity and Access Management (IAM) Market size was estimated to be over USD 9.5 billion in 2017 and is anticipated to grow at a CAGR of over 10.4% from 2018 to 2024. Identity and access management market is driven by the rapid increase in the adoption of advanced technologies including Internet of Things (IoT), Bring Your Own Device (BYOD), and cloud computing in enterprises. The rising advent of digitalization has encouraged the organizations to develop data-driven business models, making the businesses more agile and scalable. However, there are many challenges that the organizations face by adopting the connected devices including security and privacy threats. Local exposure, data leakage, data loss, insecure usage, and insider attacks are the major risks associated with these devices. Therefore, organizations worldwide are adopting IAM solutions to curb the risks associated with the adoption of advanced technology solutions. The rising trend of workforce mobility and web-based applications has created a major challenge for employees to remain connected to the corporate resources without compromising on security. Enterprises are hosting critical applications on the cloud, making it important to manage authorization and authentication for numerous web applications and organizational data. The Asia Pacific region accounts for the highest mobile workforce with a share of around 55 percent followed by the UK and the U.S. with 10.9 and 10.1 percent, respectively. Hence, to meet the rapid growth of enterprise mobility, organizations have enhanced the usage of centrally management comprehensive IAM solutions, which assist them in getting the required visibility and control over a distributed workforce. The provisioning segment holds the highest revenue in the IAM solution market and is anticipated to reach USD 6.72 billion by 2024. Provisioning is the process of creating and handling access to resources in a diversified IT environment, ensuring the creation of new accounts and access to data is reliable and secured. Provisioning solutions are adopted in diverse industrial applications to support digital identity creation, validation, approval, change, termination, propagation, and communication. It also offers the ability to add numerous new users uniformly and swiftly with the ability to mechanize creation, modification, and the removal of employee IDs on targeted systems, driving their growth in the IAM market. 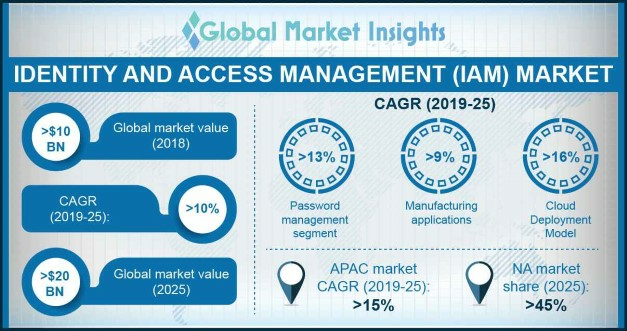 The password management segment in identity and access management market is rising at a steady rate and is projected to grow at a CAGR of 13.2% over the forecast timeline. The major factors driving the growth of the password management solutions include the rising demand from SMEs, stringent regulatory compliance, and risk management environment. These solutions offer the convenience of usage as the users can reset their own passwords without the intervention of IT staff, saving their time and additional costs, accelerating their demand in the IAM market. The rise in cybercrime threats in various industries such as BFSI, healthcare, and public sector has also increased the identity and access management market demand. In 2017, over three billion passwords were stolen, increasing the demand for password management solutions. Various MNCs are enhancing their security portfolio to deliver enhanced services to their customers. For instance, in February 2016, Dell launched its newest IAM solution named Dell One Identity Safeguard for Privileged Passwords. This will enable their channel partners to offer a complete security portfolio from one source. The on-premise deployment model dominated the identity and access management market with an industry share of 84% in 2017. The on-premise model delivers continuous and secured access to various applications, driving their demand. The on-premise solutions are implemented by companies having a strategic approach for access management alignment and demanding flexible functionality. This model can be customized as per organization-specific requirements allowing the enterprise to be in complete control of the data and managing security. However, these systems are valid only for organizations having dedicated staff, money, time, and technical expertise in place to manage the organizational access requirements. With the emerging compliance, governance requirements, and rising technological advancements, it is more efficient for companies to adopt the cloud-based IAM solutions models. The cloud-based identity and access management market is growing at the fastest rate and is projected to grow at a CAGR of 16.8% over the forecast period. The rising demand for cost-effective, scalable, and flexible solutions has spurred the popularity of cloud-based solutions. The rapid growth and adoption of Identity-as-a-Service (IDaaS) platform across various SMEs are also contributing to the IAM market development. Furthermore, cloud model assists businesses and organizations in delivering a centralized management through various services such as access management, user provisioning, directory management, and compliance support accelerating their demand in the identity and access management market. The public sector and utilities segment dominate the identity and access management market and held around 23.8% of the industry share in 2017. The major factors contributing to the growth include the rapid increase in the cyberattacks and digital transformations such as cloud computing, real-time data access to customers, and automated infrastructures. Furthermore, due to the rise in the hacking incidents, the energy and utility companies including sanitation, water generation, oil and gas, and electricity industries have been imposed with stringent regulatory compliance, accelerating the IAM market demand. For instance, the U.S. homeland security department’s cyber security team reported that around 5 percent of the cybersecurity incidents faced by the country in 2014 were due to weak authentication. Hence, the National Cybersecurity Center of Excellence (NCCoE), implemented new guidelines for the energy and utility industries to implement a centralized IAM solution with the aid of industry and National Institute of Standards and Technology (NIST) standards. The IT & telecom applications are growing at a fast rate with a identity and access management market revenue of USD 1,420 million in 2017. As the IT & telecom industry works with a large user base, it is essential for the service providers to maintain the security of the sensitive user data. Various regulatory compliances have also been enforced and a failure to abide by the same results in huge financial losses for the organization. For instance, in 2015, two telecom companies based in the U.S. including YourTel America and TerraCom had to pay an amount of USD 3.5 million for data risks. The Federal Communications Commission of the U.S. found that the companies were storing the client’s personal data on unsafe servers accessible through the internet causing a risk to the user data. Hence, these companies are required to set secured IT systems in place to provide the right access to employees, customers, vendors, and other stakeholders, fueling the IAM market demand. North America held around 46% of the industry share in 2017 in the global identity and access management market. The major features contributing to the growth in this region include the rising adoption of connected devices such as BYOD and cloud computing along with an upsurge in the usage of mobile applications. The region also faces serious cybersecurity thefts with the average cost of a data breach in 2017, being around USD 1.3 million for large enterprises and USD 117,000 for SMEs. Hence, the government in this region has formulated stringent programs and invested funds in R&D to explore best systems for protecting the user. The Asia Pacific identity and access management market is growing at the fastest pace and is projected to grow at a CAGR of 15.6% over the forecast timeline due to the rapid increase in cybercrimes, increased penetration of smartphones, growing demand for cloud-based solutions, substantial development in the industrial sector, and rising adoption of BYOD. The IoT adoption in 2013 was around 12 percent, which reached around 36 percent in 2017. Furthermore, as the region showcases huge growth potential, various companies operating in the IAM market are expanding their presence in this region to gain a higher customer base. For instance, in April 2015, Janrain, a leading customer identity management technology provider launched the first customer identity management solution in China. This will provide the Chinese population with enhanced security solutions and also assist the company to expand its operation in the Chinese market, which demonstrates an enhanced growth potential. The global identity and access management market is categorized by the existence of a large number of identity access, authorization, and authentication management providers. Various companies operating in this IAM market have adopted the business strategy of mergers and acquisitions to expand their customer base and gain a competitive edge in the market. For instance, in May 2017, Gemalto, the international digital security company acquired 3M’s identity management business. This acquisition will enable the company to offer advanced security features by adding biometric technologies and related advanced security features to their portfolio. Some of the leading vendors functioning in the identity and access management market include IBM Corporation, Symantec, SailPoint Technologies Holdings, Inc., Gemalto, Crossmatch, Okta, Inc., Oracle, CA Technologies, OpenText Corp., Ping Identity, ForgeRock, OneLogin, Inc., Net IQ, HID Global Corporation, and Dell, Inc. The expansion of the IAM solutions has provided huge benefits to the organization in terms of meeting the growing regulatory compliance reforms and secured access to the employees, reducing the data breaches. It also decreases the burden on the IT department due to the self-service functionality offered by the solutions. IAM delivers secure ways to authorize, authenticate, and manage users without compromising on usability and convenience. It provides the flexibility the enterprises require to accommodate the latest technologies and trends extending their businesses outside the traditional perimeter.